For the past three days I have been down with sun exposure. It is pretty hot here in Chennai. I must have been exposing myself to too much sun. then there was this eggless baking class for 11 am to 3pm for two days. Feeling worse because of that. Just lots of fluids and staying away from fried items and pickles. 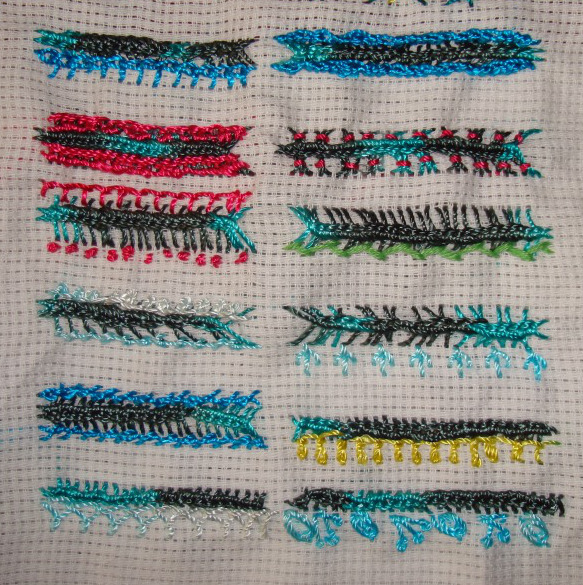 I completed a small sampler of whipped spoke stitch on monday. Which will be posted once I am out of this phase. I have not made much progress on my UFOS to write. to see others progress visit Pintangle. We were on vacation to Chennai, India for two weeks. We visited Bangalore and some temples around our village with our family. Our family Deity [ AngallaParameswari], Avanivanallur, Alankudi [ Guru], SriVancheeyam [ Yamadharma], Ramaswamy[ Kumbakonam], Pattiswaram[ Durga], Suryanar Koil[ Sun], Vaitheeswaran Koil- were the temples . All the temples are centuries old, makes us feel and both proud to be a part of these and humble that how insignificant we are. This trip was more of a pilgrimage to offer thanks to God for looking after us during my hubby’s emergency surgeries. We also had Navarathri Festival during which we refrain from stitching. So lots of excuses for stitchfree vacation. SharonB had asked about the length of my TAST samplers. 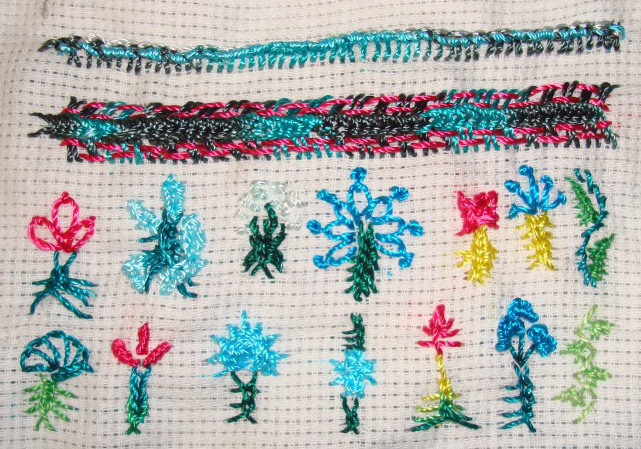 The sampler are of 4 inches width. They are still individual pieces, which I am hoping to assemble together one day. 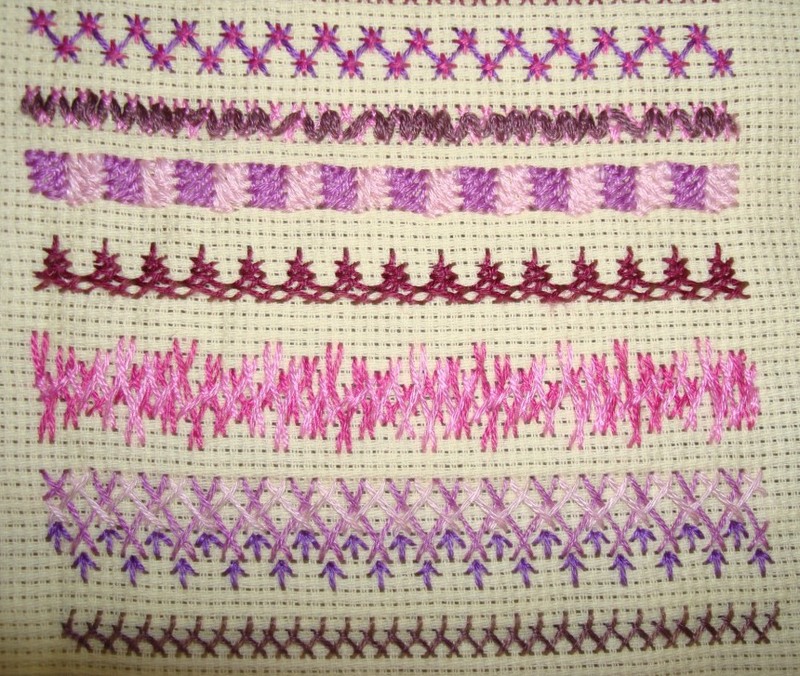 TAST sampler details– I started stitching TAST sampler in 2009, when the TAST challenge was restarted on stitchinfingers. I worked 16 of the challenge stitches. The total length of these 2009 year sampler is 14. 4 feet. 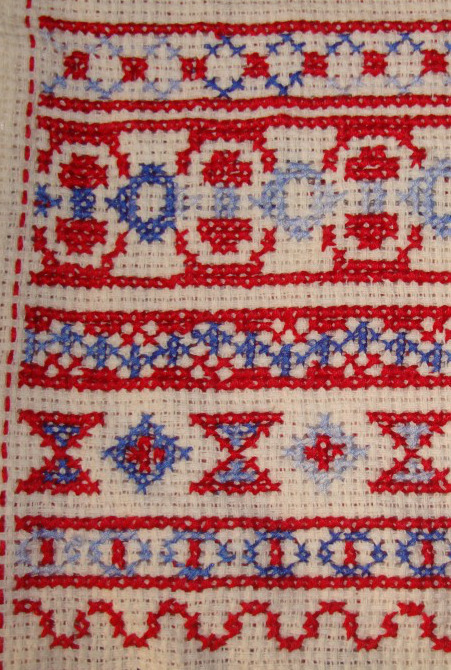 In 2010, I joined the TAST challenge on Pintangle and worked 28 of the challenge stitches. the length of 2010 sampler is 23. 5 feet. 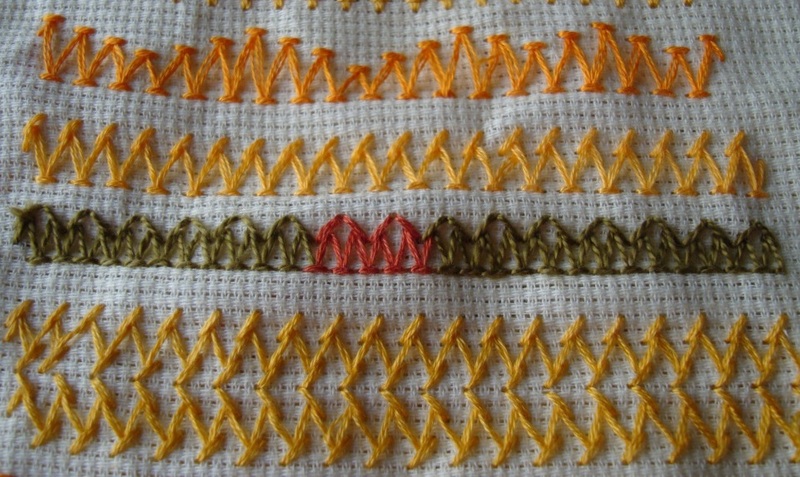 In 2012, joined the TAST challenge on Pintangle and completed all the stitches. The length of 2012 sampler is over 40 feet. In 2013 , joined the TAST challenge on Pintangle and completed all the stitches. The length of 2013 samplers is 32. 5 feet. This year too, I started working the stitches as band samplers which is 15 feet in length. And after 22 weeks moved on to working the challenge stitches on some designs, these design samplers are of varying length and width. I have got the sampler fever again and plan to work the stitches which need catching up as samplers. The total length of all these samplers cross 125 feet at present. 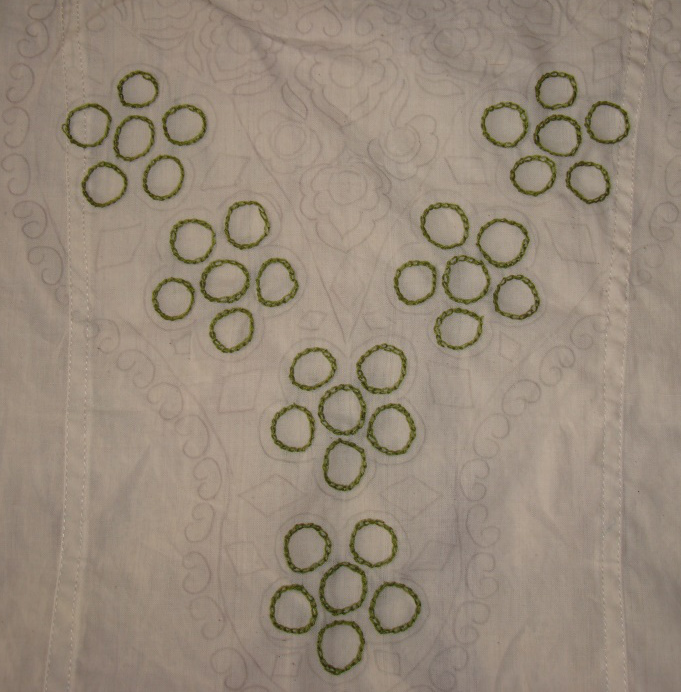 The outlining in chain stitch[green] for mirrors to be attached later was worked on the cream tunic before I left for India. 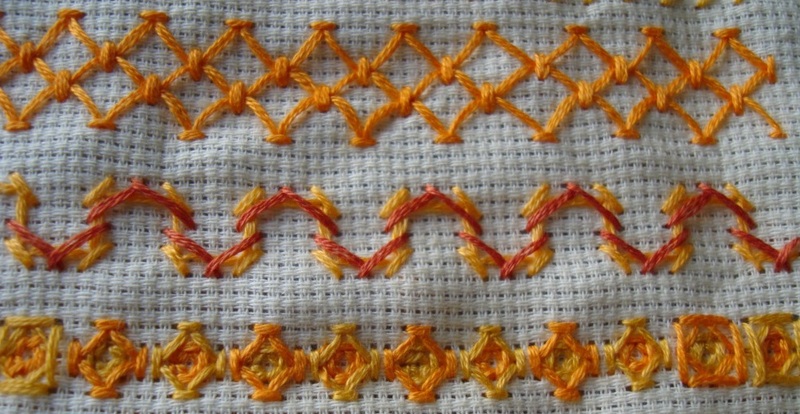 These samples are worked by varying the height of the stitches and keeping the number of stitches from three to seven. The first sample is worked vertically and the rest horizontally. I like this stitch worked in conical shape with a twist in the middle. This was an easy stitch to work, but needed to effort to maintain evenness of the stitch which I couldn’t achieve in most part of the sampler. The smaller versions look better. 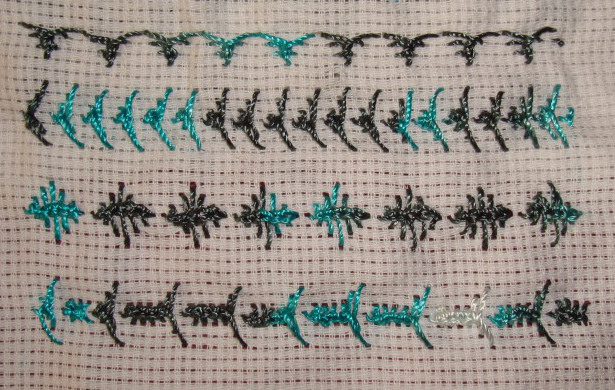 Working Vandyke stitch as a line stitch, other stitches are worked with it in these samples. 3. 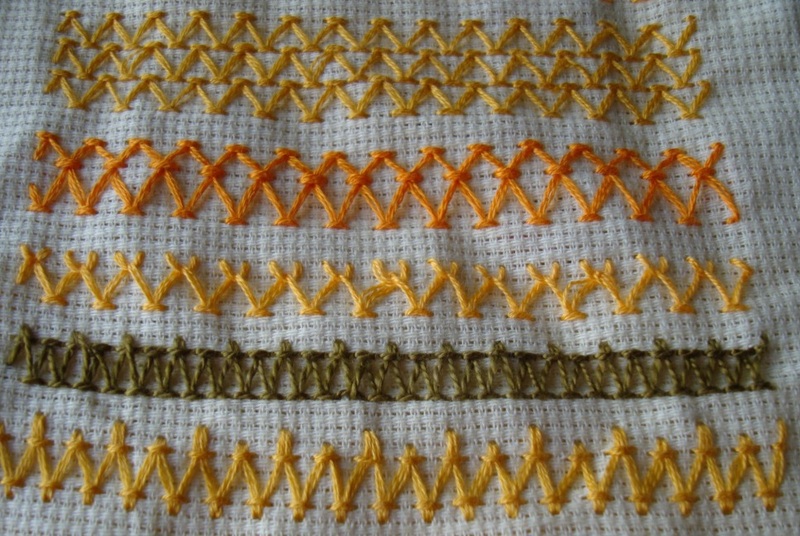 The other stitches here are-sailor stitch, Portuguese stem stitch, Portuguese border stitch and sheaf stitch. 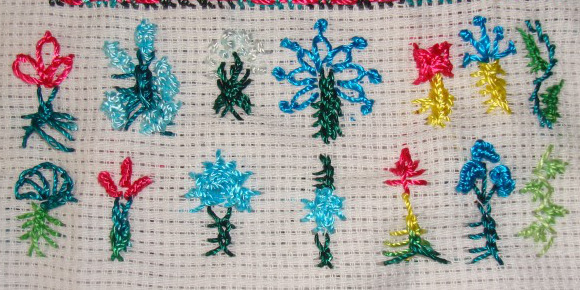 Buttonhole stitch, french knots, herringbone, coral and wrapped coral stitches and fly stitches. Twisted chain stitches, basque stitch[ started with top knotted buttonhole ], triangular feather stitch, berry stitches and pistil stitches. I was on vacation when this stitch was announced on TAST 2013 stitch challenge by SharonB. I had worked this stitch during a previous TAST challenge, still I want to explore this stitch some more. 1.In the first sample, one side of the central chain stitch is whipped. 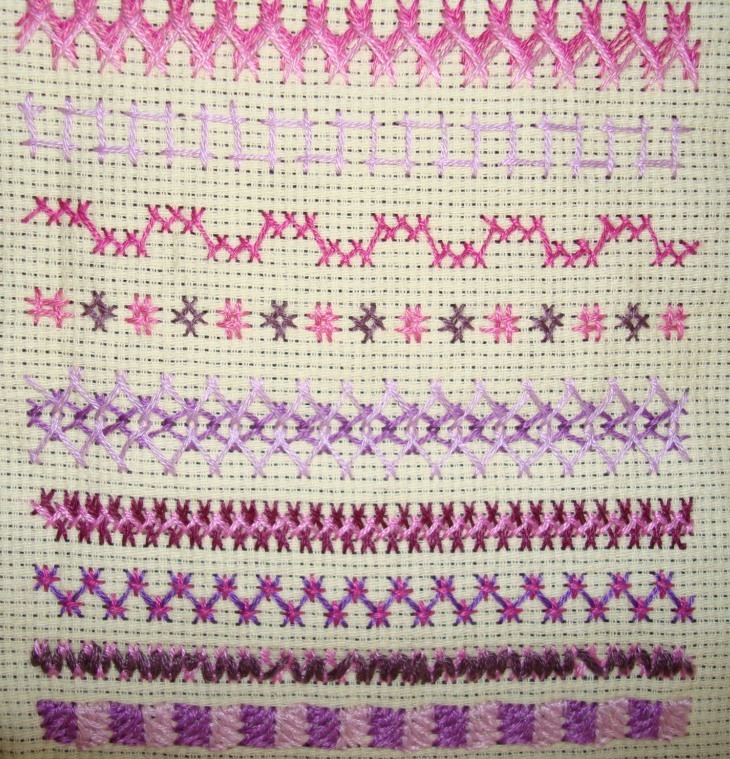 In the second sample, a wide version of Vandyke stitch is worked and pink thread is woven through it. Detached chain stitch, woven detached chain stitch, french knots, Italian border stitch, raised cross stitch flower, pistil stitch, stem stitch [stem], buttonhole wheel, bullion knot, whipped wheel, laced square herringbone, slipped detached chain, cast on stitch and arrowhead stitch. phew! Week sixth stitch of the TAST 2012 stitch challenge by SharonB is chevron . This stitch was also a part of the earlier TAST challenge. I worked this stitch when it was rerun on the stitchin fingers group. But I did not post the pictures then. I returned from India today, so did not have time to start on new variations of this stitch. I have to think of some variations of chevron stitch on plain cloth with other stitches,but that’s for tomorrow! 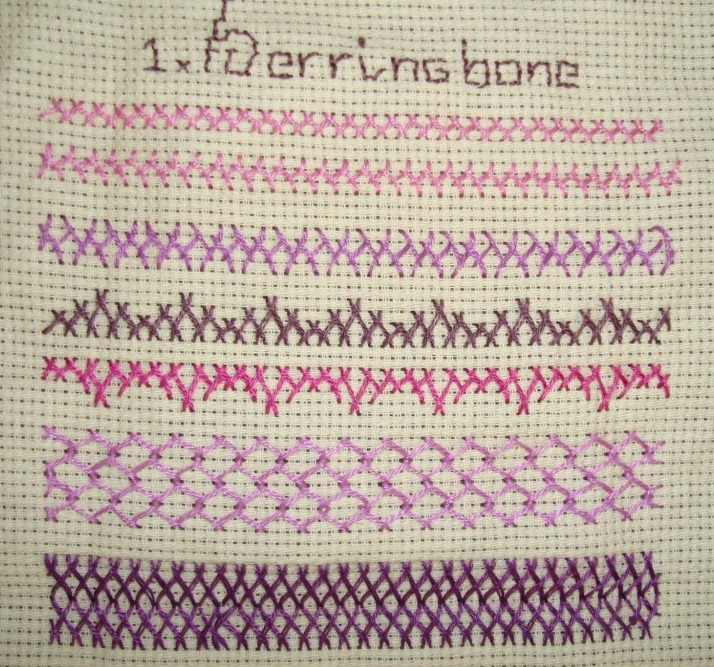 This week’s stitch of the stitch challenge TAST 2012 BY SharonB is herringbone stitch . This was the first week’s stitch of the earlier TAST challenge. I had already posted this sampler on my blog, but for easy reference I am posting it again.